Innovative thermal imaging surveillance cameras from 360 Vision Technology, the leading UK CCTV design and manufacturing company, are helping to protect people and infrastructure at Bristol’s world-famous Clifton Suspension Bridge. Designed by Derek Maltby of independent Security Consultants Global MSC Security, the novel thermal imaging project was specified to protect the famous structure from damage and ensure the safety of the hundreds of people who use the bridge every day. Harnessing the performance of 360 Vision Technology’s thermal cameras which compliment a network of standard video surveillance cameras, the new system deals with a range of on-site surveillance challenges. One of the world’s most famous and recognisable structures, the Clifton Suspension Bridge, designed by Victorian engineer Isambard Kingdom Brunel, spans the River Avon linking Clifton in Bristol to Leigh Woods. Opened in 1864, today, the bridge carries the status of a Grade 1 listed building. Carrying the busy B3129 road across the Avon Gorge, the distinctive landmark caters for four million vehicles each year. An iconic symbol of Bristol, the bridge has featured in many television ads and programmes, and has been the venue for significant cultural events, such as the handover of the Olympic Torch relay in 2012. When the bridge’s management decided that the original camera installation was increasingly showing signs of its age, both in performance and operability, they turned to security consultants Global MSC for help. “The existing analogue camera system had become out-dated during its many years of service”, explains Derek Maltby of Global MSC Security. “We were tasked to identify a plan within a budget to bring electronic surveillance at the bridge up to standard, whilst ensuring the long-term viability for CCTV on the bridge. “On trialing cameras, one of the major issues we came across was that conventional HD models were being blinded by the bridge’s structural lighting. During the hours of darkness, the whole bridge outline and its famous features are lit with powerful LED lights that ensure the iconic landmark can be seen from a distance and look superb as a key tourist landmark. Unfortunately the cast from these lights means conventional cameras, no matter what their quality, were being dazzled by the lighting and lost significant surveillance capability during these times. After testing the capabilities of the 360 Vision Technology Eclipse Thermal Static Camera on-site, the project was specified to include a mix of Eclipse Thermal Static Cameras to compliment a network of standard HD cameras (for use during daylight hours). The 360 Vision Technology Eclipse Thermal Static Camera is an IP67 rated IP thermal imaging camera built to perform in the most challenging environments. 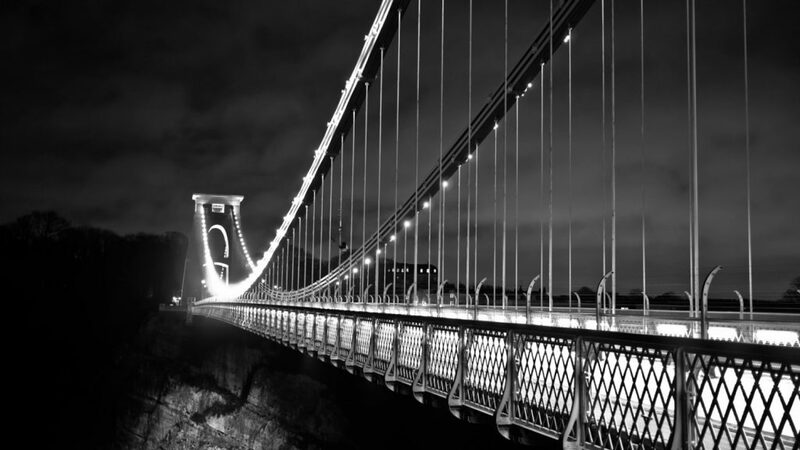 Designed and manufactured in the UK, the professional quality camera delivers high-contrast picture detail to the bridge’s security office, where they are archived via NVR and monitored by Clifton Suspension Bridge Attendants. Each Eclipse Thermal Static Camera features advanced camera software with Digital Detail Enhancements to deliver sharp images – negating the need for time-consuming set-up adjustments, and to ensure the best quality thermal images and simple installation. At the security office, the thermal cameras’ efficient and reliable imaging enables the use of video analytics, automatically alerting the security team to any unusual events on the bridge. This includes the use of virtual ‘tripwires’, ensuring any pedestrians or vehicles that enter unauthorised pre-defined areas are automatically highlighted to the security staff – allowing them to react accordingly, and minimise the impact of any incident with a quick response. “The installation of 360 Vision Technology thermal cameras has delivered multiple operational benefits at the bridge,” explains Clifton Suspension Bridge Master, Trish Johnson. “Using thermal technology, the enhanced visibility during poor weather and hours of darkness has increased the operational effectiveness of our total security package. “Additionally, being able to take advantage of automated surveillance analytics has meant our security team can now focus their efforts in other areas, only concentrating on the cameras when an incident is detected and an alarm activated when the programmed analytics rule is contravened. “As a Grade 1 listed structure, the bridge needs 24-hour protection from damage, either malicious or accidental. Pedestrians and traffic can cause damage to the structure unintentionally, so it’s our responsibility to make sure we protect this valuable asset and preserve it for everyone to enjoy.